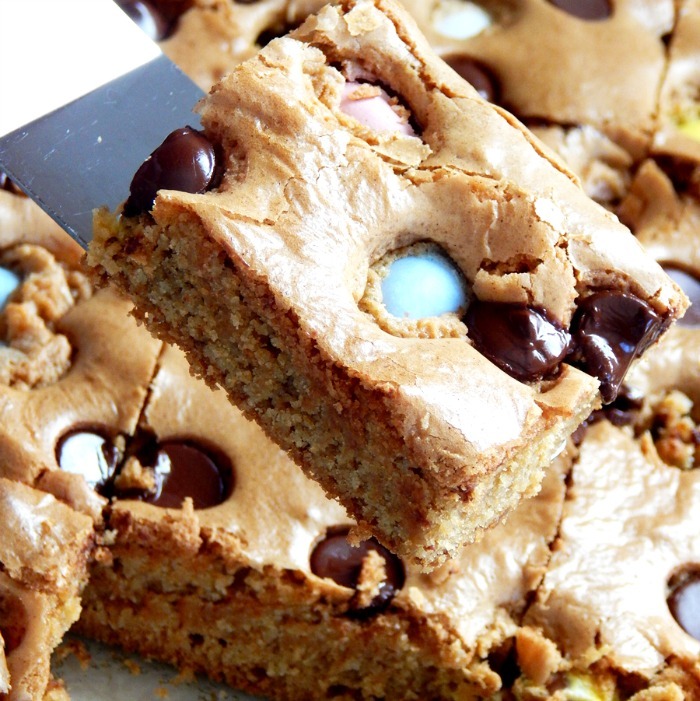 This blondies recipe can be made with any kind of chocolate candies with a coated shell, such as M&Ms… but I happen to have a package of Cadbury mini eggs on hand. 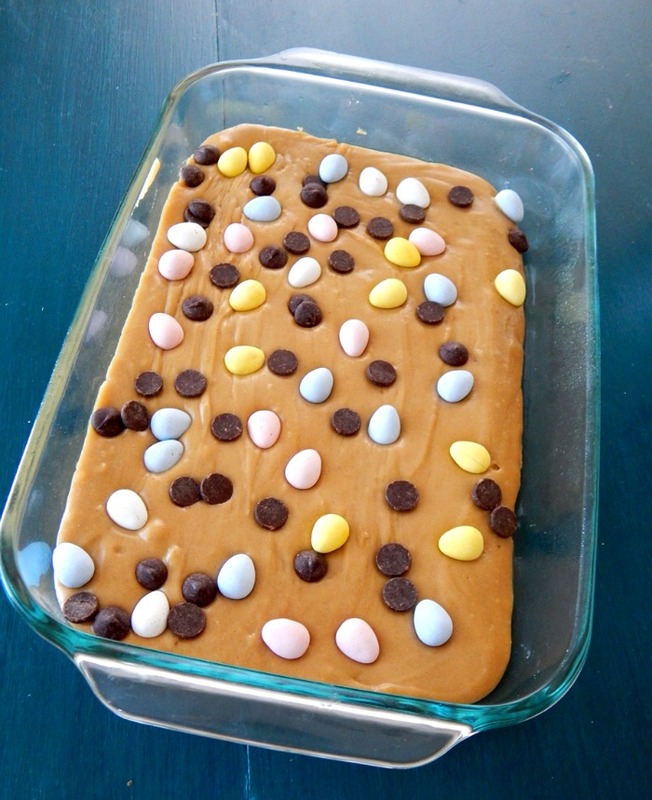 So even though it’s summer, I’m making this an Easter Blondies Recipe. Step 2: Start by buttering a 9X13 pan and set aside. Step 3: In a medium sized pot add in brown sugar and butter. Melt on medium heat until smooth. Step 4: Remove from heat and add in 1 egg at a time. Step 5: Continue by adding in flour, salt, baking powder, and baking soda. Stir until smooth and well combined. 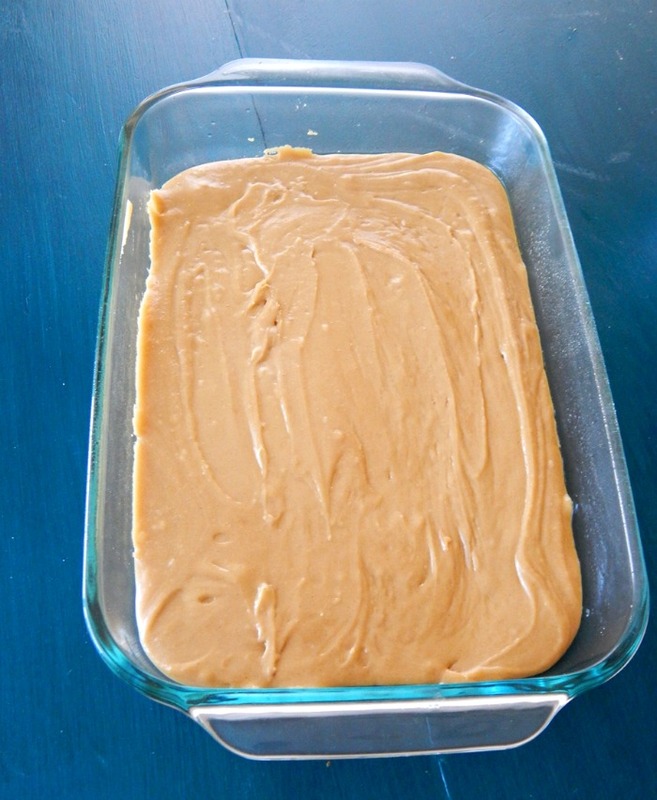 Step 5: Spread batter into pan evenly. Step 6: Sprinkle on chocolate chips and Cadbury mini eggs evenly over the top and press down slightly. Step 7: Bake at 350 for 25-27 minutes. Step 8: Once cooled, cut into bars and enjoy! Find even more delectable recipes on The Jenny Evolution! 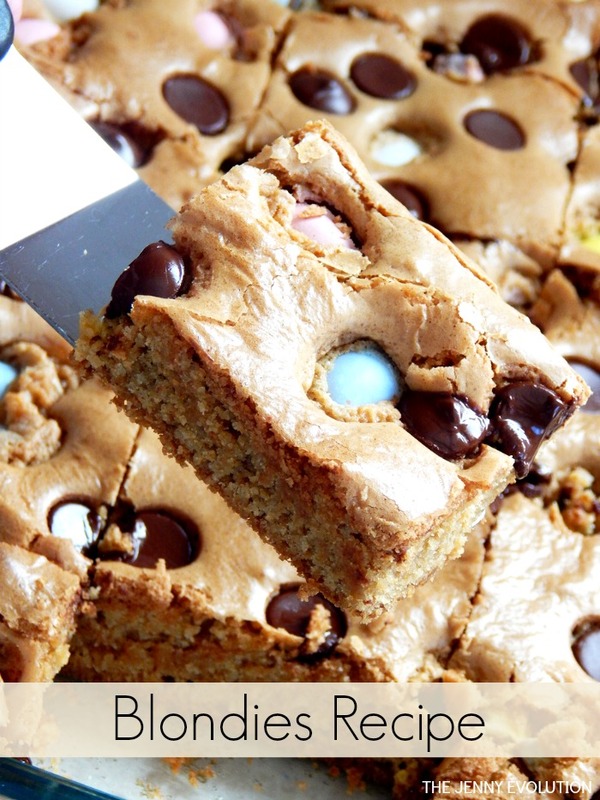 This blondies recipe can be made with any kind of chocolate candies with a coated shell. Start by buttering a 9X13 pan and set aside. In a medium sized pot add in brown sugar and butter. Melt on medium heat until smooth. Remove from heat and add in 1 egg at a time. 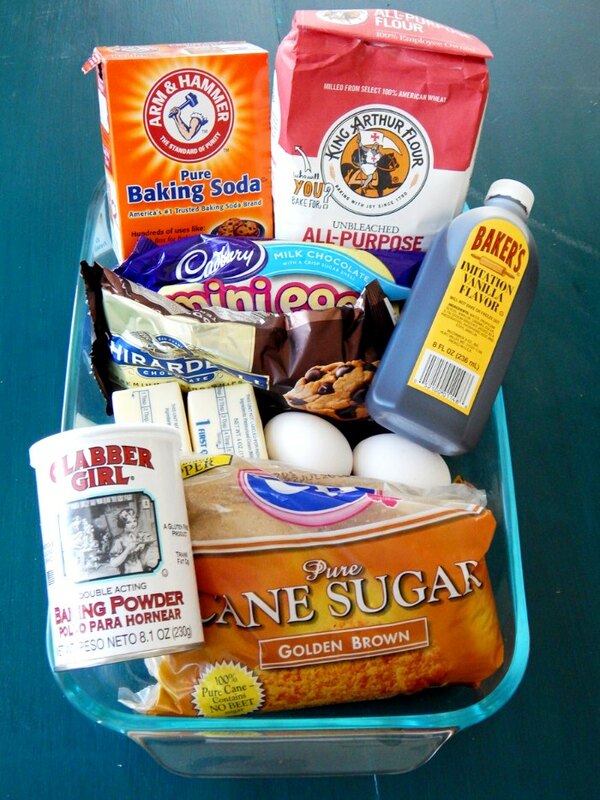 Continue by adding in flour, salt, baking powder, and baking soda. Stir until smooth and well combined. 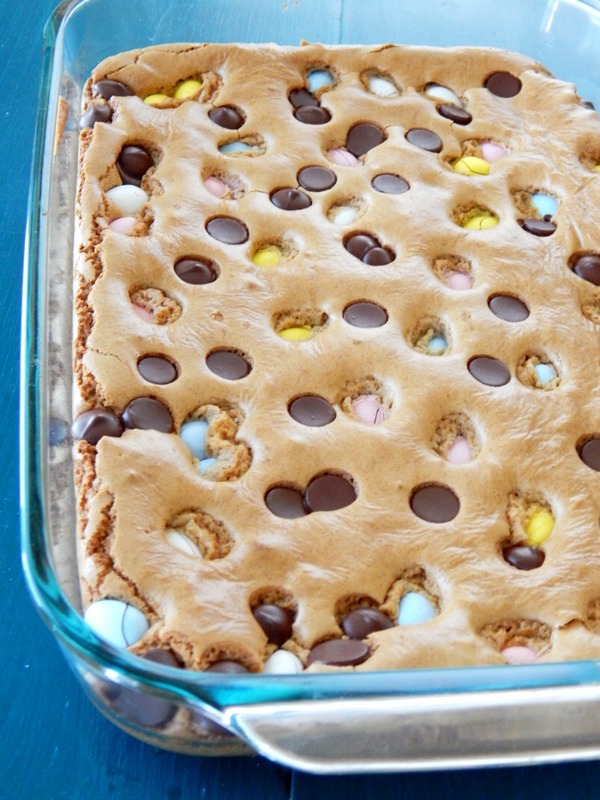 Sprinkle on chocolate chips and Cadbury mini eggs evenly over the top and press down slightly. Bake at 350 for 25-27 minutes. What a great way to use all those little bits and pieces! Thanks for sharing on the What’s for Dinner link up and don’t forget to leave a comment at the party – Next weeks features that also leave a comment get pinned and tweeted! Looks like this could be a popular kid dessert. Thanks for sharing on Family Joy Blog Link-up. Please come back and join us again! YUM! I often freeze leftover chocolate candies from the holidays specifically so I can bake with them and spread out that sugar intake for my boys…. I fully admit that we rarely have mini eggs left though; they are my favorite! This looks so good. Pinned. What a great idea! The candy gets used up and you have a delicious dessert! Thanks so much for sharing with us at Share The Wealth Sunday! Greatly to use up candy and I love blondies. Thanks for sharing with us at Throwback Thursday. Pinned and shared. Hey Jennifer, I love this – and it would be great after Halloween, too, when I always seem to have an odd assortment of candies! Judging? lol, not me! I just ate a two year old (or was it three?) year old chocolate bar that I had hidden inside a ceramic rooster and forgotten about!! It was excellent…lol!! Thanks for sharing with us and all the bloggers at Throwback Thursday! LOL! Thanks for the confession 😀 Candy is ALWAYS good!